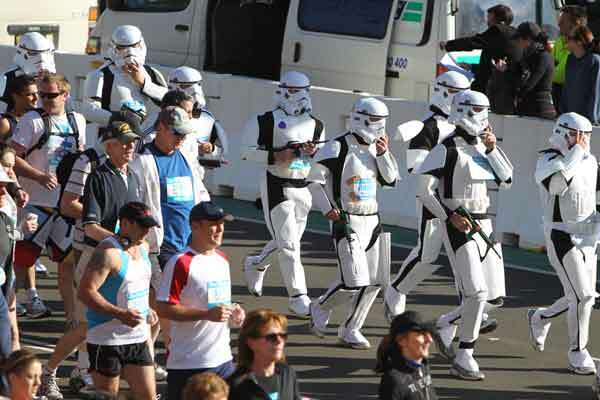 The PR Team would like to congratulate the 502nd Stormtrooper Legion for their participation in Sydney's "City 2 Surf" marathon today. Affectionately referred to as "City2Surftroopers", the 502nd rigorously prepared for the event by releasing and then chasing down Rebel insurgents. The 502nd would undoubtedly have won the race were it not for the appearance of a Rebel Running Faction, which they were forced to pursue and terminate before completing the race. Well done, boys. Enjoy a well deserved Dark Cider at the beach this afternoon! Photo by Steve Christo taken from: www.smh.com.au.